The park as seen from the southeast; the limit is not a high fence, but a lower one with a deep gutter. 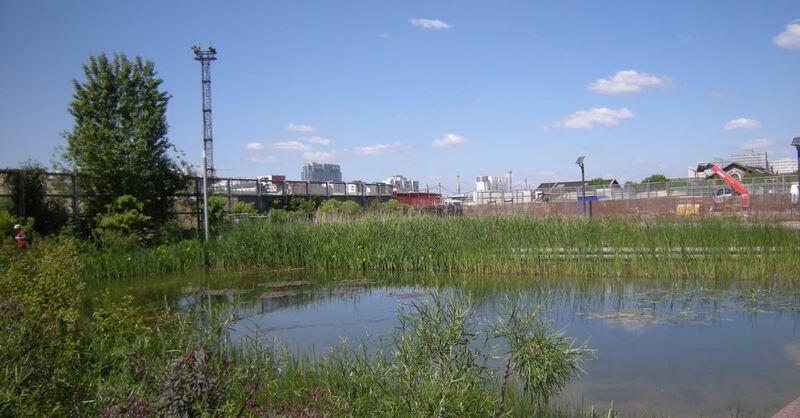 Batignolles has been marked for over a century by the rail yards leading to the St Lazare Station, one of the main access gates to Paris from the west. 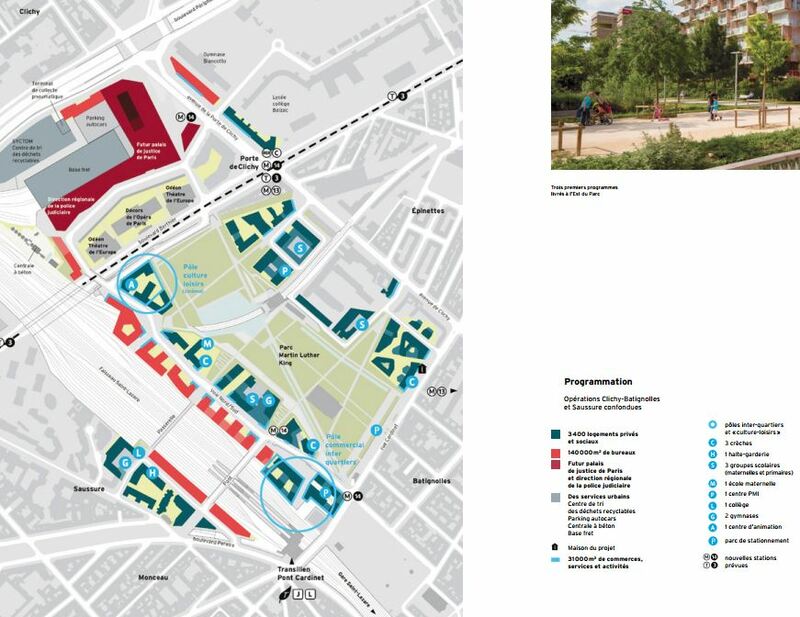 The housing area around the park is a set of sustainable development technologies and icons, but as always the real sustainability will depend on the consumption habits of the citizens. 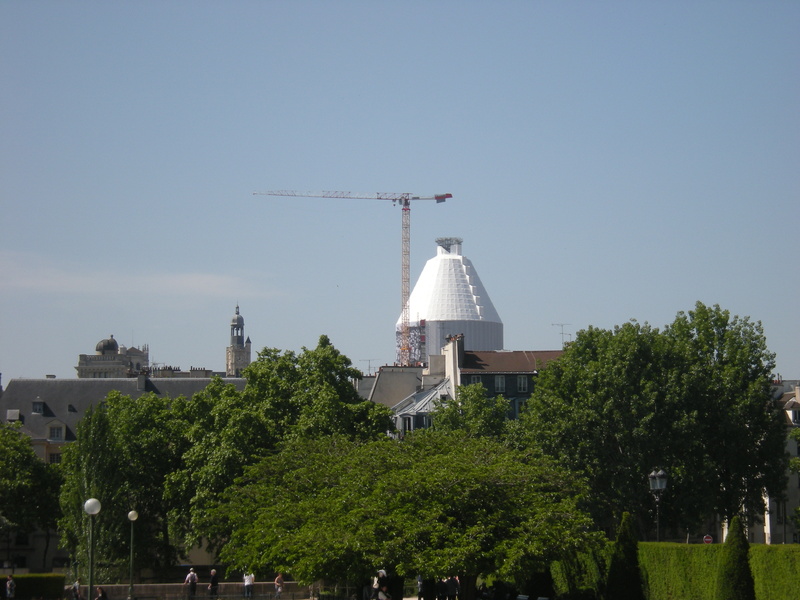 Some 35 years ago I visited Les Halles for the first time; I was a small kid, but I remember going out of a then brand new RER through a hole (set to later become the central court), and seeing on the background the church of Saint Eustache. 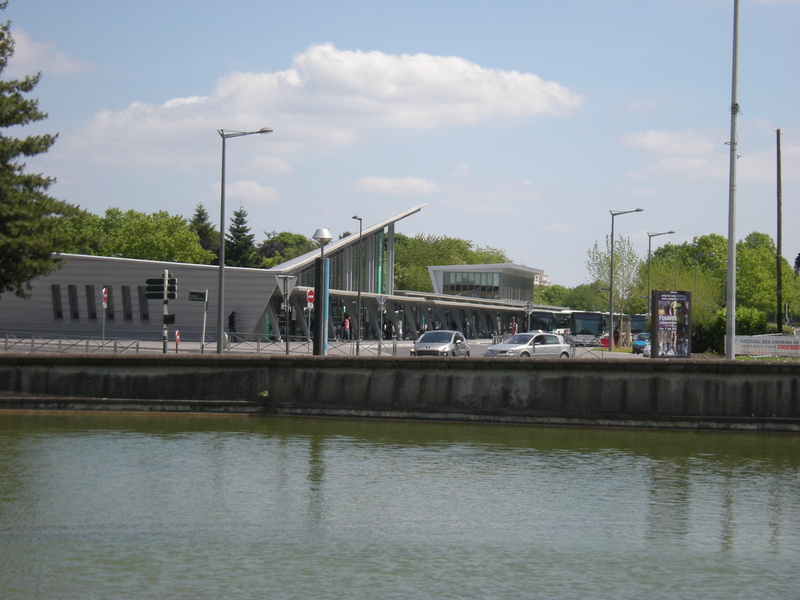 The commercial centre is open in 1979, at the most central spot of the Paris public transportation system. 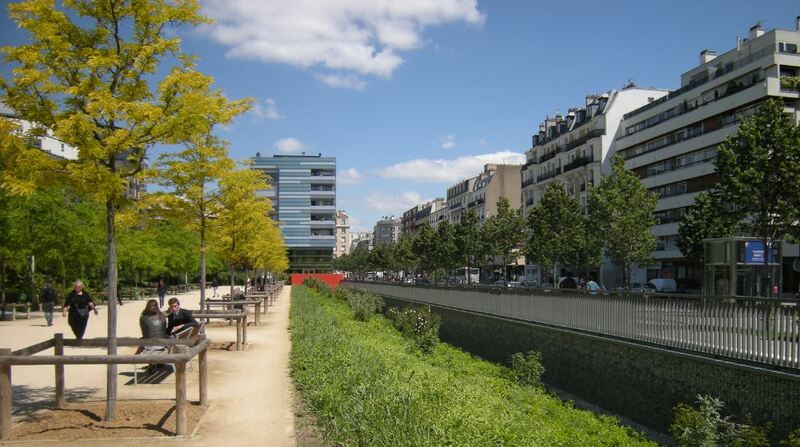 Vasconi and Pencreac’h’s architecture has not aged well, and in 2004 the City of Paris held a competition to renovate the commercial centre and the associated underground city, which extends under the garden up to the Bourse du Commerce. 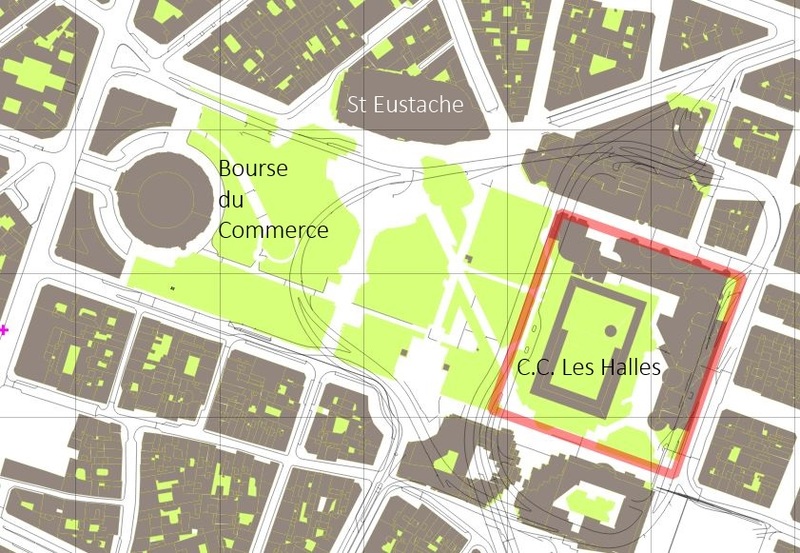 David Mangin’s project, winner of the competition held in 2004 to choose an urban planning scheme for the scope of what one were the Halles, or central market, has been critized; it is too early to evaluate its qualities, but it is no doubt a clear change. 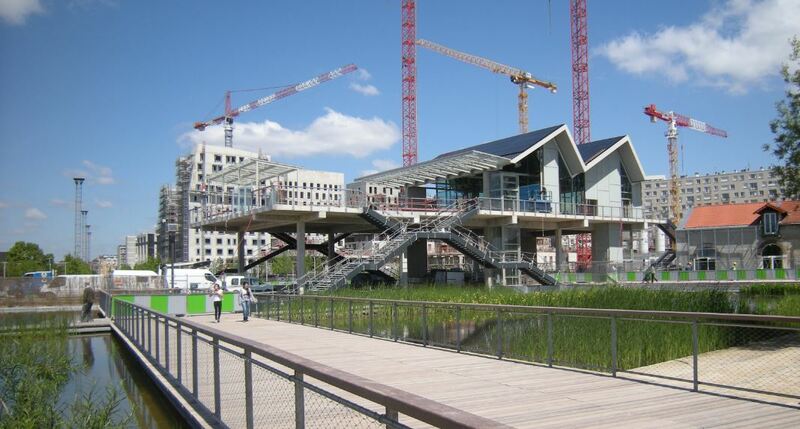 The images in this post portray a particular element of the planning scheme, the Canopée+Pôle Transport project, which concerns the architecture of the large glass structure over the main court of the present mall and its connection to the underground station, and is being built according to the project by Patrick Berger and Jacques Anziutti Architectes. 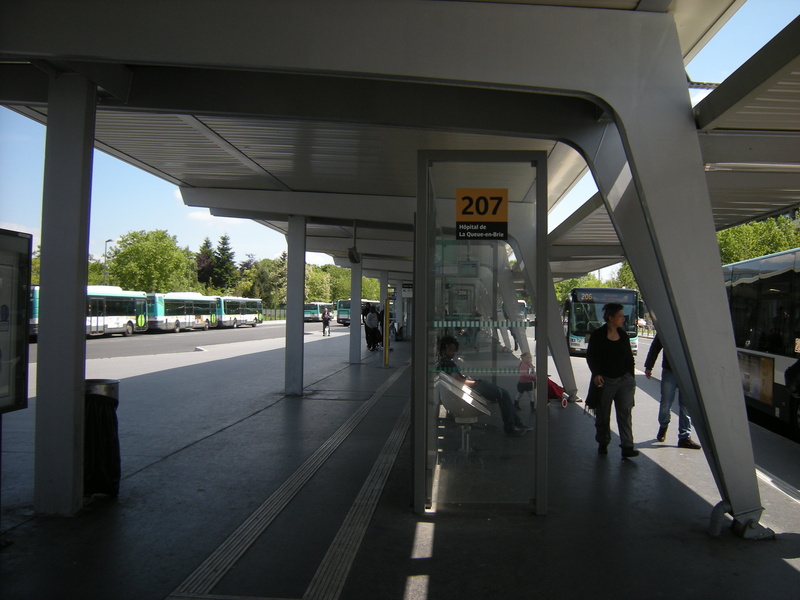 Works have three interest points: on one side, the glass canopy that will cover the “hole” to the underground. On the other side, the works while the commercial centre stays open “as usual” (not often well solved, but it is not an easy job). Finally, the large concentration of temporary structures for the different specialists working on the project, which seems at first sight a housing project. 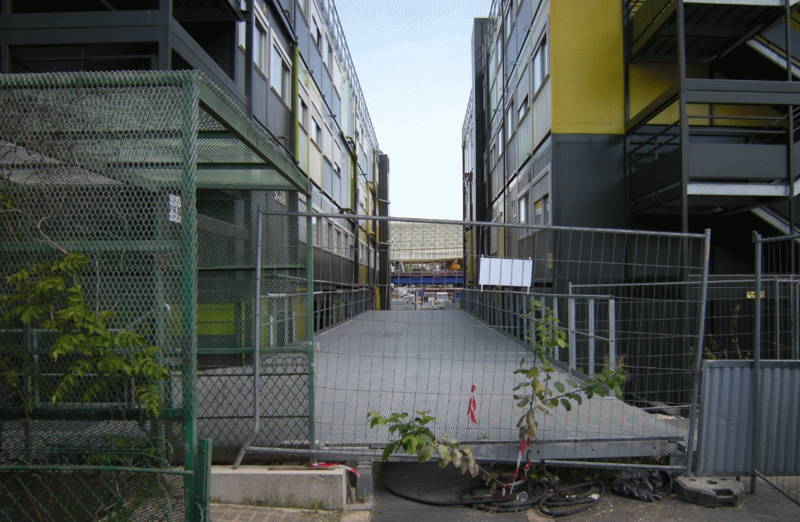 In some months the results will be seen; now you can already see the green spaces organized in a more informal way. 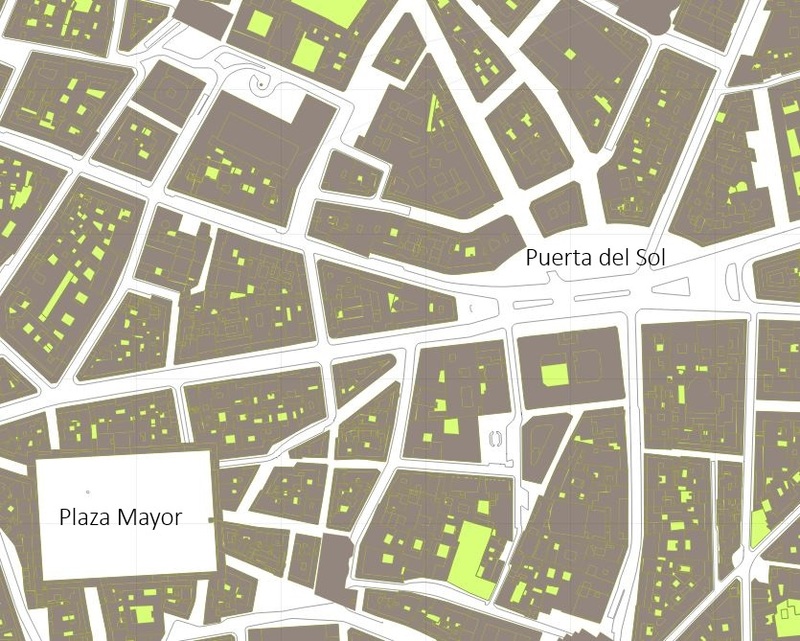 As a comparison element, maps at the same scale (overlay grid is 100 m) of Les Halles (previous configuration, with a sketchy red outline for the Canopy), and of the Puerta del Sol in Madrid, that after the opening of the new Cercanías (a system like RER in Paris or BART in San Francisco) plays a similar urban role, albeit with a more traditional architecture. 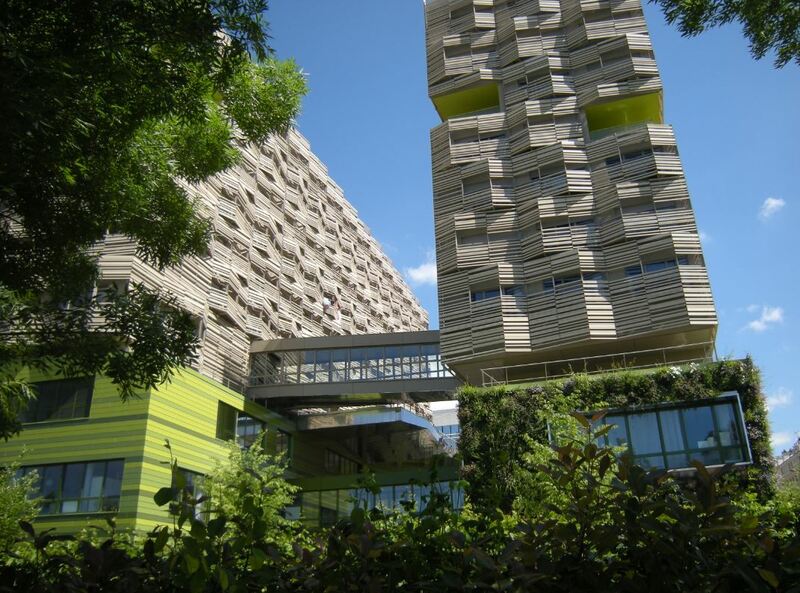 The International College for Territory Sciences (CIST) is an institution established by Paris 1 and Paris- Diderot Universities and the French National Scientific Research Council (CNRS). As European Election Day has come (it is just today, so if you are in Europe and can vote, this could be a good moment to go…) the College has published a set of quite schematic maps on the European context. Even some elements are reduced to graphs, as the image portrayed here, but this reduces by no mean their interest. The right to difference exists in this Europe… Google has published today a ballot box in its Spain, France, Germany and Italy versions, but… nothing to declare in its UK version (sure, they voted during the week, but results are today…). 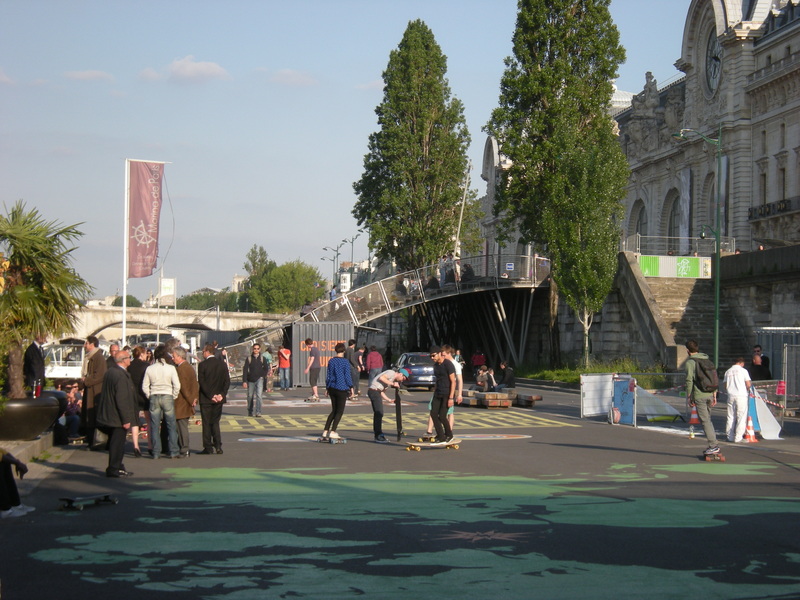 The Municipality of Paris has closed to traffic a part of the embankment on the Seine that had been used as a freeway during the second half of the XXth century. This can be ascribed to a drive to limit the use of the car that originates in European rules on air quality and a fight against traffic congestion that was shared by the two main options in the recent municipal election. 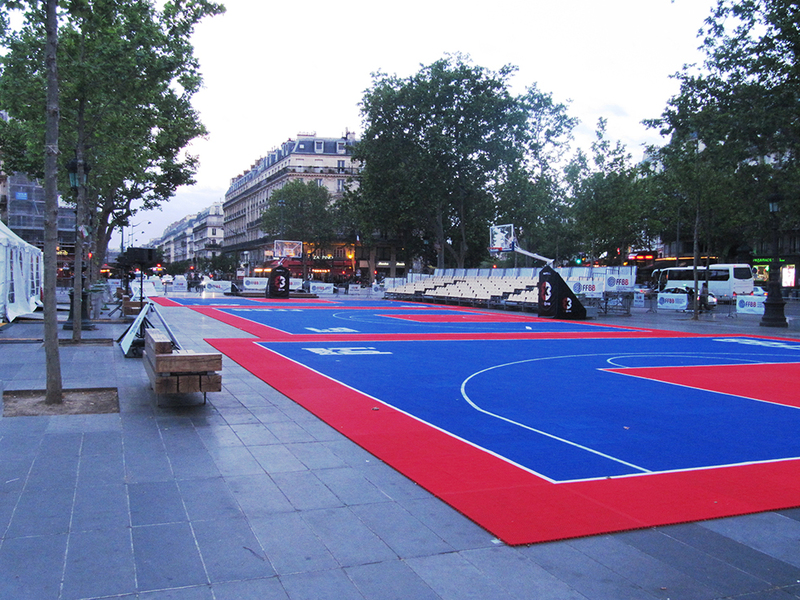 The Parisian solution has been almost the opposite of what Madrid did facing what seemed an identical problem. 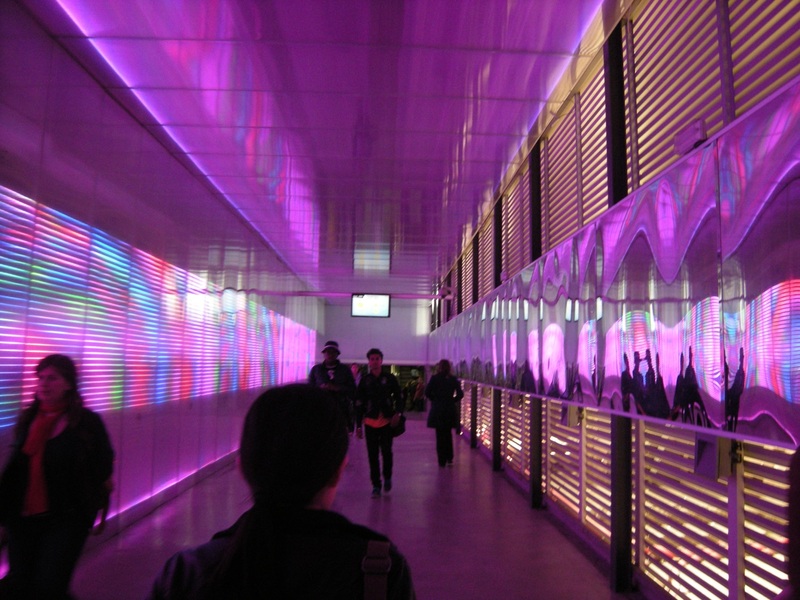 Madrid has chosen to bury the freeway under its former site, creating a new public space project on a much larger scope. 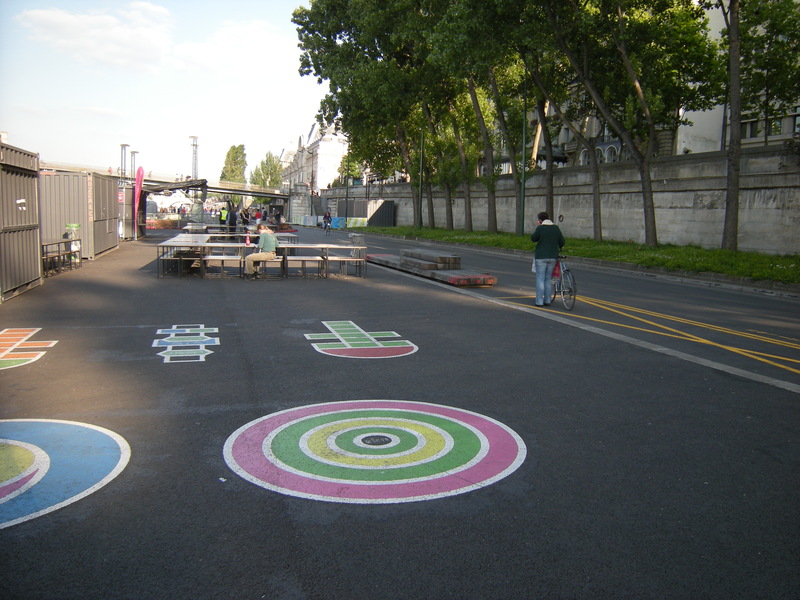 Paris has not substituted the eliminated car space, and the asphalt has not been removed; it has become a platform for varying uses, as a tv set in some way. The cost is much lower, and the use more flexible. Doubts can rise on whether this is a more or less ambitious scheme, but it seems more sustainable. 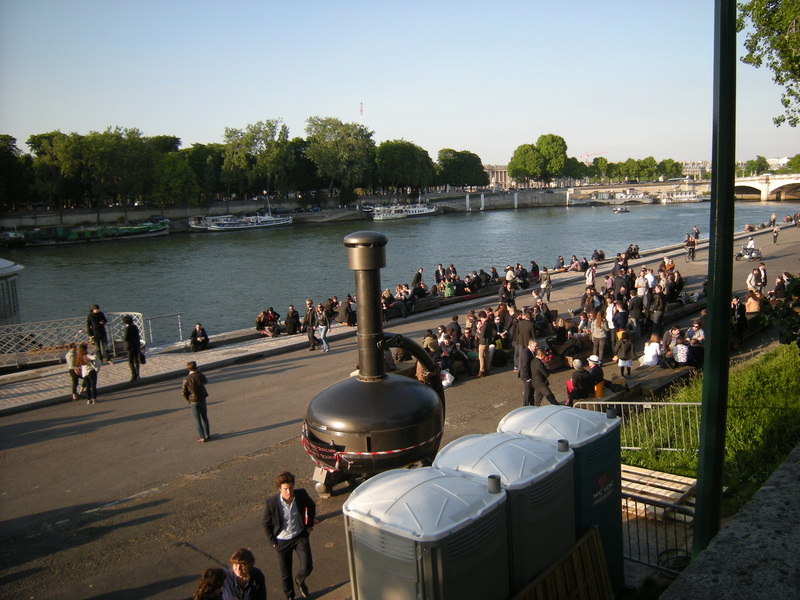 A project as the one in Madrid would have been far too complex, among other reasons due to the cross section, which in Paris maintains the traditional embankment walls (essential in case of flood, a problem tackled in Madrid with a preexisting upstream reservoir), and on the higher level the conventional traffic goes on as usual. There is also a historical dimension, on how the “urban prosthetics” end up reconfiguring the city. In Paris as well as in Madrid, these fluvial freeways appeared when the city was already present on both sides; but in Paris it was the historical core of the city around the corridor, while in Madrid the Manzanares shores were recent tissues of scarce urban quality, so the freeway was located with a rather savage approach. 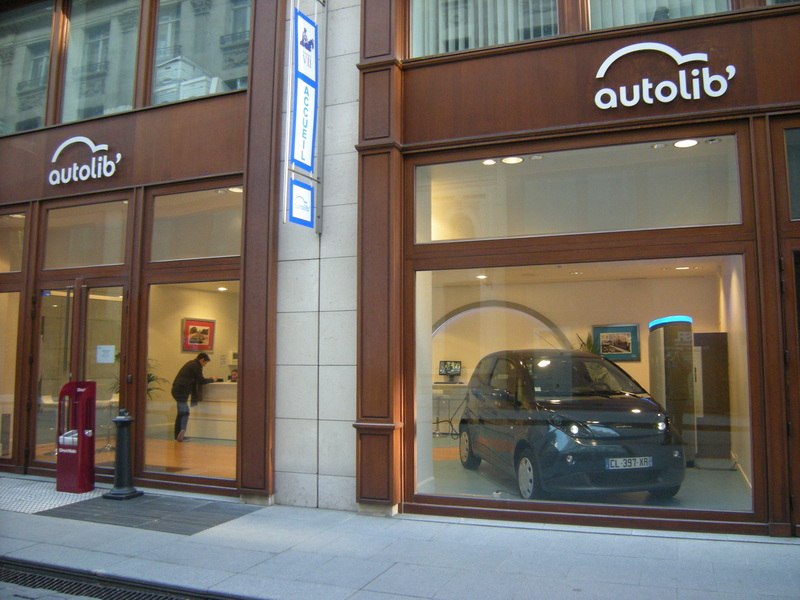 In Madrid the freeway was the street on which the entrance halls to the apartment buildings opened, and burying the freeway has given for sure a substantial reduction in noise; in Paris, cars still run over the higher parts of the embankments. This is a matter of choice between closed (and expensive models) that try to deliver substantial transformation (and a compromise, trying to entice the car-loving voters…) and more flexible models that try to address a more complex problem, including historical heritage and flood risk, with chances for incremental change. 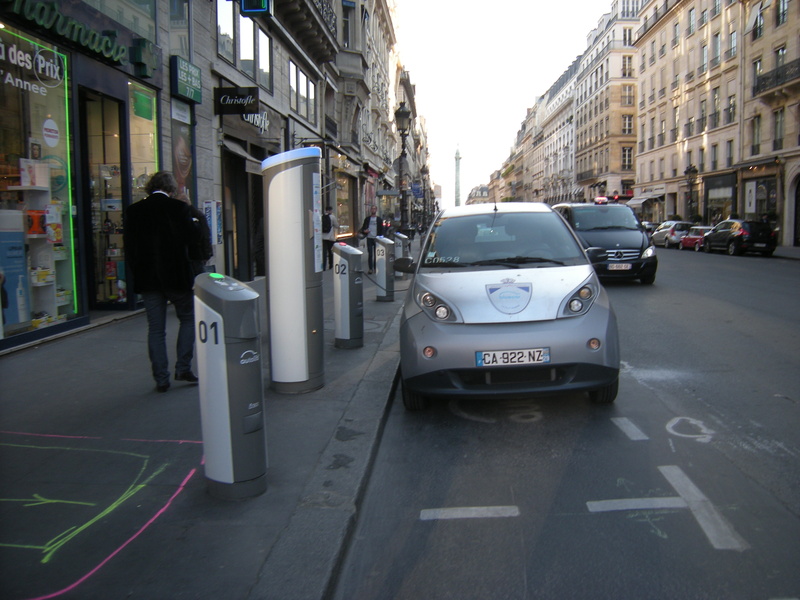 Conserving asphalt (as it has been done in the car-less embankment in Paris) doesn’t seem a bad solution. Sure, as the 1968 revolutionaries said, the beach is under the paving stones, but on asphalt things can actually happen.